For anyone who attends live music regularly, it is likely they have been subject to the cynic’s lament regarding the encore. “Why do they bother leaving the stage? Everyone knows that they’re coming back out.” The encore is partitioned to be the sole standalone portion of the set. It’s an island just off the coast of the show. It is dessert. It is also the only time that one can count on a song (or songs) being chosen specifically for bombast, sincerity, or to induce a jubilant sing along, before sending their disciples off in to the night. Wednesday night at Hollywood & Highland, Grouplove appeared as part of The Encore Live, Live Nation TV and Hard Rock’s new program “celebrating the encore as an art form.” Set a mere few miles from the site of their first show as a band at El Cid, Grouplove took to a mini stage in the round on the floor of the Hard Rock Café to perform one extended encore. It is a joyful concept when conceptualizing a show; kicking the door in and heading straight for the jugular. On the front end of promotion of forthcoming album Big Mess due September 9, the good time band was in typical high spirits. The energy was shared by their fans that gathered around the circular stage and otherwise braved the epicenter of Los Angeles tourism in order to see an abbreviated set. The show started with the tongue in cheek absurdism of “Beans on Pizza,” a bonus track off of 2013’s Spreading Rumours, that climaxed with a stop-you-in-your-tracks falsetto from Christian Zucconi. Before the second tune, the band summoned to the stage two young guys who were sporting homemade Big Mess t-shirts, clearly blowing their summer vacation minds. 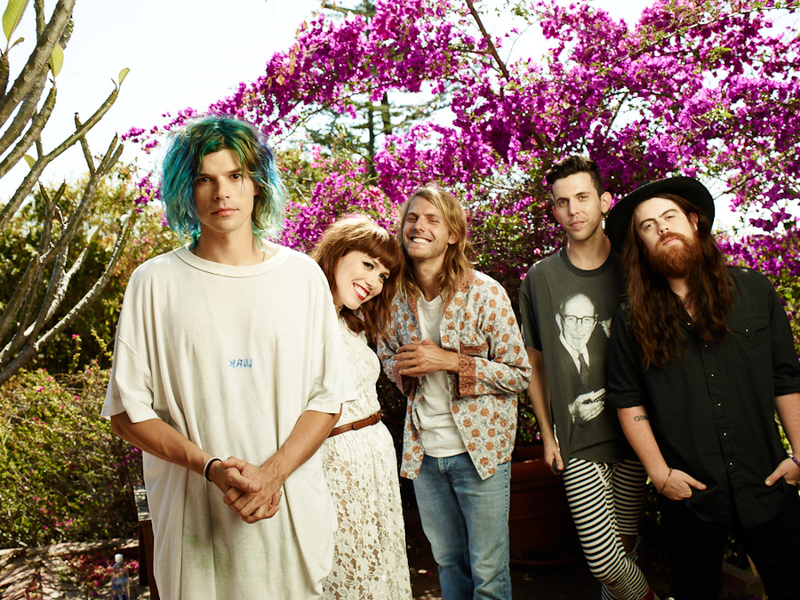 Always armed with a good cover song, from The Who to Beyonce, on this night Grouplove unfurled Cage the Elephant’s “Spiderhead” which gently traded back and forth between male and female-led vocals. When plucked acoustically, the mood was vaguely akin to the sad charm of “No Surprises,” both sonically and lyrically (“I think your mother wants me dead”).